Solo Exhibition at Museum nan Eilean, Lionacleit, Benbecula, Outer Hebrides, Scotland. Using field recordings, interviews and archive materials, ‘The Hebrides Suite: mapping the islands in sound’ explores aspects of island life past and present through the medium of composed sound. Recordings both make and are memories - ghostly traces of the past remaining in time and space. These traces of the past echo and reverberate through language, place-names, family stories, song and the sounds of the natural world to form a sonic background to the present. 'Sandy Jaffas' (2015) one of the three sound pieces, was commissioned this for this exhibition and made in collaboration with the S2 Gaelic class from Sgoil Lionacleit in Benbecula, members of the Comann Eachdraidh Uibhist a Tuath (North Uist Historical Society) and South Uist Historical Society and supported by Museum nan Eilean, London College of Communication and CRiSAP (Creative Research in Sound Arts Practice). 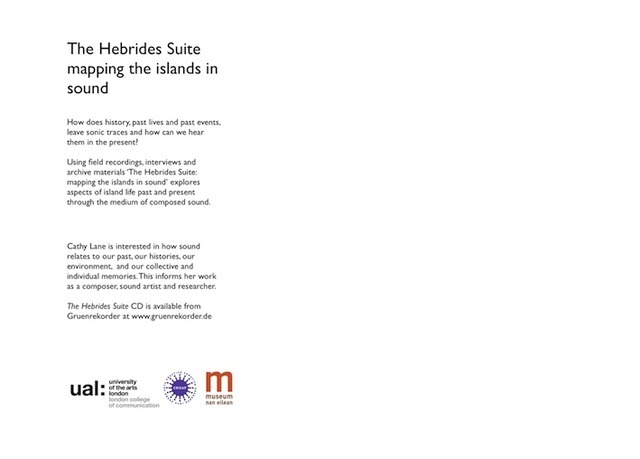 Three eight channel sound works and a large wall piece which maps the Uists according to field recordings made, and places mentioned, in the interview and archive materials used in the compositions.